This thread is for brief notices of lost/stolen instrument reports we have heard about. In many cases, we do not have photos or other information. Where possible we will highlight the name of a forum member or link to a forum thread having more details. To keep this thread short so folks checking on an instrument will read through all of it, we will keep it pinned and closed. Let one of the admins know if a notice should be added. Of course, you may start a regular forum thread to discuss or help with any of these cases in detail. Right now is a good time to take some photos of your instrument(s) and store them in several places, as Irene suggests below. Here are previous notices from the C.net home page. If you have information to add, write me off forum. Thanks. 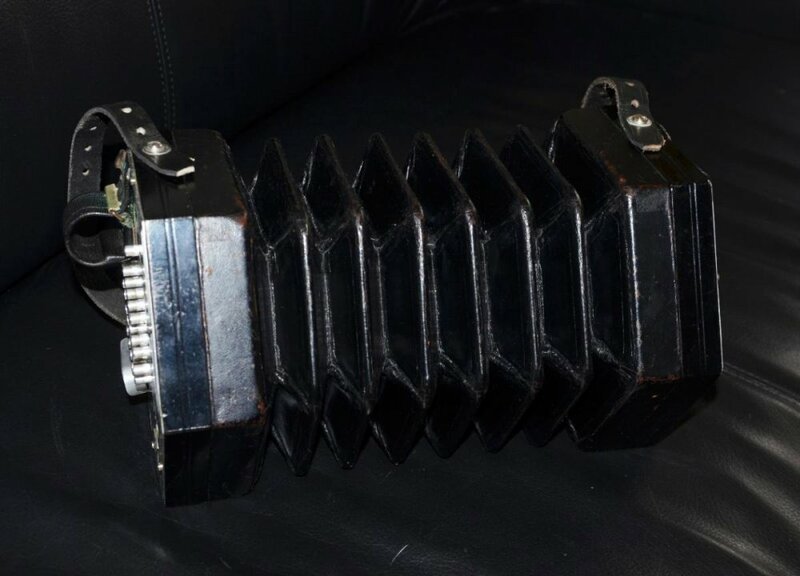 From Chris Timson, 7 Dec. 2009: A friend of mine has just phoned me and asked me if I would pass on details of his stolen concertina. His name is Richard Harris and he lives in Bradford on Avon. The concertina was stolen from his home along with two melodeons, so it sounds as if the thieves were musically clued up. The concertina is a Jeffries metal ended anglo, 32 button Bb/F in old pitch and is Richard's pride and joy, so he is naturally quite distressed by its loss. From Ralph Jordan, 31 Oct. 2009: Lost or Stolen 17 October 2009 in Sheffield UK. :48 key Wheatstone English, Serial Number 9199. Contacts: Sylviane 0775 7243960. sylviane.bartowlak AT ntlworld.com Or Sheffield Police. From Shay Fogarty (SeascaShay on forum): A Lachenal 32 key C/G anglo concertina, metal ends, bone buttons, was stolen from a music shop at the Fleadh Ceoil in Tullamore Co. Offaly on 22 August 2009. The number is 183596 which is on a paper between the D/E and B/C buttons on the inside row. It is in the style of those made for the Salvation Army with full metal ends and mahogony tops. If you hear of any such sale please contact me in confidence. Recovered 2-1/2 years and a continent away thanks to a diligent pawn shop owner who spotted this notice! From Paul Jutkiewicz (Southampton, UK): I had my concertina stolen in Dublin (15 February 2008) along with a set of Northumbrian pipes. 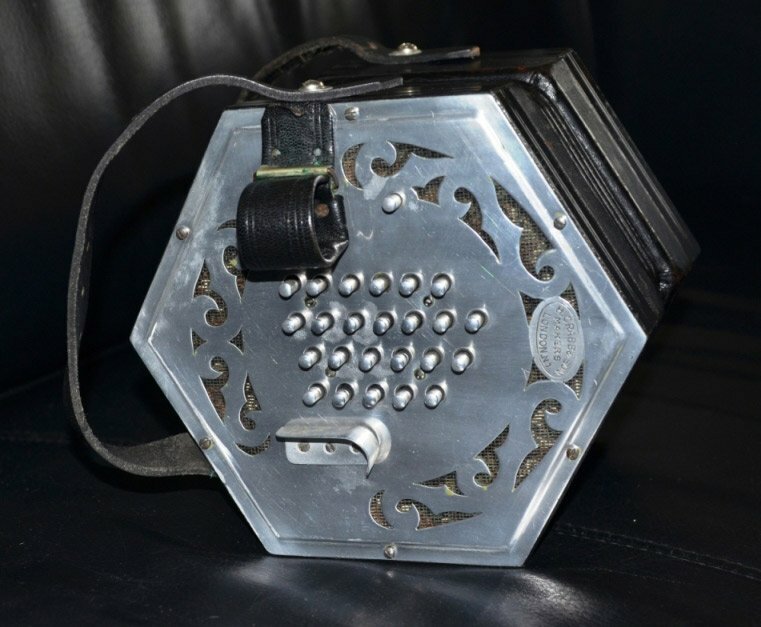 The concertina was a Dipper Anglo, 32 metal buttons and metal ends plus one or two modifications to the accidentals. Stolen on Thursday 11th march, from a van outside the Whitmore Arms public house, Orsett, Essex, UK. Wheatstone Tenor Treble with raised ebony ends, serial no. 29103. If you have any information please contact Roy Nicholls on +44 (0)1621 859446. Nov. 6, 2003: Michael Rooney from Monaghan, living in Dublin, has had his Suttner stolen in Galway. The serial number is 131, which is on the side of the concertina. It has metal ends, 30 keys and ebony trim. If anyone hears of a concertina of this description being sold, call Aonghus Rooney on 087-6409105 or call Michael on 086-1755329. Please look out for two concertinas stolen from the Music Room, Oxford, UK, branch 23 July 2003. These instruments are brand new, one English treble and one English baritone model, made by Morse of the USA. The serial numbers are 137 and 138. The Music Room is sole British agent for these instruments, so please inform us at +44 (0)1274 879768, or at info AT the-music-room.com if you see one of these instruments for sale anywhere else. We will then pass on your information to the police, who have of course been alerted. We know that the concertina fraternity is a close-knit group, and we would be grateful if you could pass the word to all players to keep an eye out for these instruments. From Simon Thoumire: "My 56 key Wheatstone tenor treble Aeola (metal ends) was stolen on Sunday 21st January from the Glasgow Royal Concert Hall. The serial no. has fallen off the left side but it is recognisable from the big thumbstraps that are hanging loose from the side and also sweat has tarnished the nickel plate on both sides. Another feature which will tell it apart from any other is that the top 'C' on the right side is an air button. It is the only instrument I have ever played and I miss it badly." 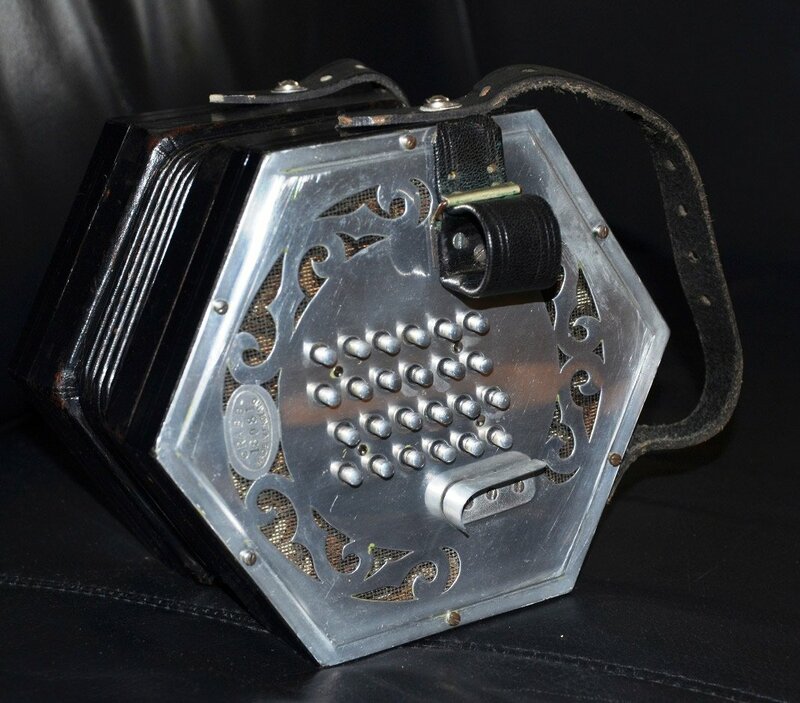 From Hugh Healy: "My concertina was stolen at the Willie Clancy School this summer (1999). It was a Wheatstone Anglo, Metal end, No 29481, 30 key, 5 fold bellows in C and G pitch. My address was marked in several places on it." -- Contact david.evans AT pc.aerotech.ie if you have any information. "It looks just like the pic below... I am not 100% certain of the serial no. but Andy thinks it may have been 706." 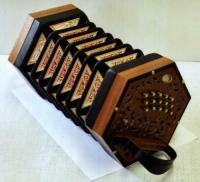 I joined yesterday in the hope that someone, somewhere will help locate my Concertina. Heres a video of me playing it with some of my mates from College. From Bruce McCaskey on behalf of a friend of his. "Last week someone broke into my boat, moored under cover at Seattle Yacht Club. The boat was recovered a few days later, having been stripped of everything pawnable, and MY CONCERTINA! It is my Morse, which was not covered by insurance. It was purchased in 2005, serial # 346. It is a bit unusual, being black, while most of his anglos are natural. Also, the first two buttons in the R-hand accidental row are C#/C#, and C#/D#." Would you add the basic description to the lost and stolen list in the forum? List me as the contact point (bruce AT angloplayer.com) and I'll pass the word to David. CONCERTINA RECOVERED, a happy ending. Lost, possibly in a London taxi, a 1960's Wheatstone - Black - Metal Ended Tenor English - 48 keys - C below middle to F four up. The top Eb on left doesn't speak on draw very well and the D# also left side an octave below warbles on draw. Lost between Pimlico and Clapham on Saturday 26th around 7:30 PM ... most likely in taxi from Clapham South. 8 sided black frame and bellows, metal sides & buttons. LOST CONCERTINA RECOVERED - a happy ending. On Dec. 26, 2017, at around 11 PM, my concertina was stolen while I was on the NYC Subway. It is a lovely Jeffries 38 button C-G. The bellows are original and, as such, are a little leaky. The bellows have the the gold papers attached. SUBSTANTIAL REWARD OFFERED! Contact me at John Dexter, dexvla@aol.com, 917-405-4227. My Crabb 48 key EC treble built end off the 60-ies, serial 18081, got lost or stolen early Januari 2019 due Postnl's, DPD's or Chronopost's sloppiness during shipping it to France. Please PM me or call the local police if you saw it ... thanks.